Hodosan Shrine (宝登山神社) is one of 3 major shrines in Chichibu, Saitama. It is one of the oldest shrine in Saitama. It was established in the time of 12th emperor, Keiko. In Japanese Myth, the Royal Prince Yamato Takeru no Mikoto built the shrine here during the expedition of war to the eastern Japan. When he was surrounded by the enemy's fire, the divine dog appeared and saved him from the fire. He highly respected this dog and built the shrine here. Today, as the protector of the fire disaster, many people still worship here. The main shrine has a beautiful carving art. 1. use Chichibu line to Nagatoro. Enshrines: 1st Emperor Jinmu, Ooyamadumi no Kami, Homusubi no Kami. 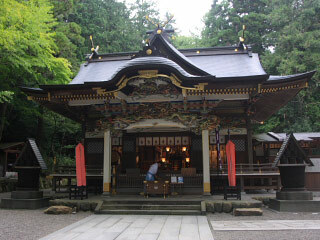 This shrine was established in the time of the 12th emperor, Keiko. The royal prince, Yamatotakeru no Mikoto, was the duty of conquering the eastern Japan by the order of the emperor. He climbed up Mt. Hodosan and pray for his victory and cleansed his body and soul in this mountain. Suddenly, this mountain was set on the fire by his enemies. He was already completely surrounded by the huge fire. Then, the group of dogs appeared and put the fire out in order to help him and his army. He climbed up the mountain with the leading from those dogs. Then, when he arrived the top of Mt. Hodo, all the dog disappeared. He thought those dogs were the messengers of the god established the shrine. Hodo literary means stopping fire. The main shrine was constructed in 1847 and it has a beautiful carving arts.